Orthopaedic surgeon Brian Thornes has put injured sport and rock stars back on their feet. He hopes his quick fix for hip patients will work the same magic. Thousands of Foo Fighters fans were devastated when the lead singer, Dave Grohl, broke his leg on stage in Stockholm two weeks ago, forcing the band to cancel their headline Glastonbury appearance. When Grohl’s X-ray appeared online, however, the inventor Brian Thornes was delighted. Thorne recognised the medical device implanted in Grohl’s ankle as the TightRope, which the former orthopaedic surgeon invented. Apart from the occasional rock star, hundreds of thousands of people globally including leading rugby and American football players have a Thornes invention holding their ankles together. Sitting in a nondescript office in Dublin’s Northwoodbusiness park, surrounded by awards for medical innovation, Thornes, dressed casually in shorts and a golf T-shirt, is not your archetypal surgeon. 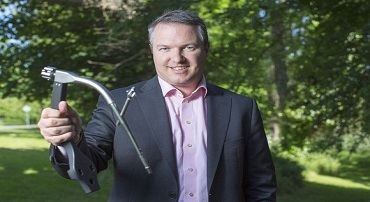 Armed with a Trinity MBA in addition to his medical degree, Thornes has been nominated for the Ernst & Young Entrepreneur of the Year award for his latest venture, the X-Bolt. The entrepreneur is hoping that the X-Bolt, which has already raised more than €2.5m in funding, will be snapped up by one of the industry giants before the end of this year. It is a replacement for the screw which has been traditionally used in treating hip fractures. Medicine was in Thornes’s family. His father, Robert Thornes, was the professor of experimental medicine at Royal College of Surgeons. “I was always sort of destined to go into medicine,” he says. In the summer of his second year at Trinity College in 1990, Thornes was involved in a speedboat accident. He had been water-skiing and, while his father had looped the speedboat back around at full tilt to pick up a ski, a crosswind blew the boat on to a direct collision course with Thornes. “It just didn’t stop, and ran straight over me,” he says. He managed to escape serious injury but the propeller caught him on the foot, slicing through tendons and nerves in his ankle. To this day, his toe curls in and part of his foot has no feeling. The accident ultimately led Thornes to invent the TightRope. “I was already hot-wired to be a gadgety inventing person,” he says. It was not until he had finished his medical degree and was looking to get on to the orthopaedic training scheme that Thornes’s research began in earnest. He didn’t set out to start a business; the goal of his research was simply to secure a place on the orthopaedic training scheme. He began looking at areas of ankle surgery and happened upon a treatment of a high ankle sprain called syndesmosis. At the time, the treatment for the injury was to bolt the two bones of your lower leg, the tibia and fibula, together. The arguments within the orthopaedic community was over whether you should use one or two screws; whether you leave the screws in or remove them; and over the size of the screws to be used. Thornes’s solution was to use suture string and a metal button attached and pulled through the two bones. This solution supports the bones but still allows some movement. He still had to prove to the medical community that his invention was better for patients. He started with a cadaver study in Trinity, which involved testing the degree of movement and strength that the TightRope achieved compared with the traditional screws. The cadaver study was a success and Thornes progressed to a clinical study in Limerick. Thornes put the TightRope prototype into 16 patients and was able to follow them through physio to monitor their recovery. “The TightRope had a faster and better recovery, so they had better ankle scores and much faster return to work or to sports and didn’t need revision surgery either,” he says. In 2000, the idea was deemed ready for patent. Thornes reckons he had put about €50,000 into developing the TightRope and secured an agreement with Arthrex, a large US sports medicine company. The agreement was based on royalties. As Thornes was the only person who had published any medical papers on the TightRope, he was the best promoter. Despite his success internationally, Thornes was not feted by the surgical community at home. Instead he encountered an unexpected degree of hostility. It eventually came to a head in 2005 with Thornes quitting his medical training scheme and opting to do an MBA at Trinity. The parting words of one fellow surgeon — “we’ll never use your TightRope here” — still jars. The device has gone on to be a huge global success. On finishing his MBA in 2006, Thornes was unemployed. He was earning royalties from the TightRope, but nothing significant. He began looking around at different projects — he even filed a patent for a golf putter. In 2007 he was mounting a TV on the wall of an apartment. The kit came with an expanding bolt to spread weight across the wall. The goal was to develop the X-Bolt in five years and sell the company. This time around he was planning on raising some investment and doing the process more professionally. The market for hip fixators globally is about $1bn (€895m). The biggest cost associated with fractured hips is hospital stay, which in the UK alone amounts to £2.3bn (€3.2bn) annually. Thornes believes that the X-Bolt could reduce the amount of time that patients are forced to stay in hospital, saving millions for health services. Thornes and a colleague from his MBA course, Declan Kennedy, raised €750,000 in the summer of 2008 just before the Irish economy crashed. With the collapse of the economy there was no question of going back to look for further funding. The initial round lasted until 2010. Since then the company has raised a further €2.5m to fund clinical research and development, including a €1.8m round led by Enterprise Equity/AIB seed capital fund. Thornes wanted to conduct the medical testing in Ireland, but says there is simply no infrastructure to run the test. The company partnered with Professor Matt Costa in the UK, who has trialled the new implant. The first patient was successfully treated with the X-Bolt in November 2011 following approval from the EU authorities. There are already large medical devices companies eyeing up the X-Bolt for an acquisition, with US Food and Drug Administration approval imminent. With FDA approval expected in September and a landmark medical trial into the effectiveness of the X-Bolt due to be published around the same time, Thornes may well make a late challenge for the entrepreneur gong. Favourite book: I don’t read a lot but I like Maths and science stuff. Favourite book is probably Freakonomics. I drop the kids to school and then whatever the day brings after that. It is not as all-consuming as being a surgeon because I can work on my own terms. That said, there are quite a few 4am starts to fly over to the UK. The key is time management: you need to tread water when you can and be prepared to go for 36 hours if you have to. People always want to work harder. I think you need to work smarter. I’m probably a lazy person. If you hire a lazy person they will find the easiest way to do something. Work smart, not hard — that’s my motto. I play golf in Portmarnock — my handicap is nine — and I like watching rugby and cricket.